If you are traveling through Colorado, New Mexico or Utah be on the lookout for the old route 666 signs, but don’t travel at night! 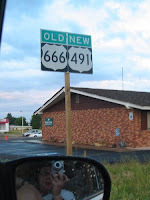 Route 666 has always gotten a bad rap for it’s unfortunate numbering and whilst locals claim the road is cursed, it continues to be one of the safest highways in the area. Hard to find these days as states have caved into pressure from superstitious residents and renamed most of the road Highway 191 or 491 depending on where you are, route 666 travelers can still tell the difference when their tires hit the pavement. Whether it’s the yellow-eyed hounds of hell chasing your car through the darkness, shredding your tires and driving you mad, or the ghost truck that careens around the curves driving you off the road, route 666 has some special experiences for those who choose to ride the road after dark-fall. Locals also claim to have seen an apparition of a girl in white and a ghostly hitchhiker so be forewarned and don’t pick up anyone on the route after dusk. Native Americans in the area also tell tales of the road, believing that skin-walkers or shape shifters haunt the road in the form of wolves, eagles and crows. Most of the mischief seems to be done by humans including the actual thievery of the route 666 signs, but troubling are the reports of satanic rituals and sacrifices of animals along the route. I have had the pleasure of traveling this route myself, during the daytime, and felt nothing untoward about it, however people still claim to have had experiences here, whether they are the result of an active imagination or real demonic presence is hard to tell. Have you ridden along the route? Share your stories. I, too, have traveled the road -- in much younger days. I lived in Colorado for a short spell and sought the highway out, looking for paranormal activity, but found none. I am glad that reports continue to come in about the road. Perhaps I should venture that way once more.